The carpet & the spectator revolve in mid-air at the same time! THE SPECTATORS SEE ALL SIDES! A small platform on casters is rolled to any spot on the floor desired. Resting on the platform is a beautifully decorated two-fold screen. It supports a platform with gold fringe representing a carpet. The carpet seat is tufted and padded for comfort, and it shows up well at a distance. 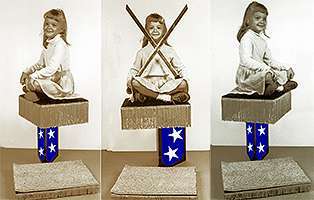 A person weighing up to 110 pounds sits cross-legged on the 'carpet'. Then two chrome-like swords are placed on the bottom platform and secured to the underside of the carpet to further support it. You move the Screen off the Platform onto the floor away from the floor! Now the 2 Swords are removed & waved under the carpet! The Spectator is on a 'Flying Carpet' ! NOW the KICKER Wave your hand toward the carpet and it revolves! Pass a hoop over the spectator & the carpet! All 4 sides are clearly seen. Packs flat easy transport and shipping.